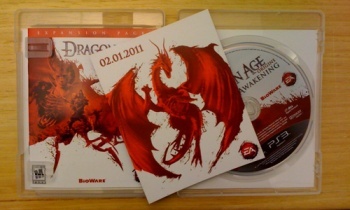 Dragon Age 2 Release Date Already Set? Something big related to Dragon Age is already planned for release early next year. With Dragon Age: Awakening less than a week from its March 16 release date, copies of the game have been distributed to retail outlets to prepare for its street date and to media so that its likely goodness can be reviewed. While those copies in retail stores cannot be opened for fear of the wrath of EA, media outlets are actually supposed to do so. According to 1up, the case for Dragon Age: Awakening includes a card that provides a hint towards something big related to the franchise coming in early 2011. The card has an image of a bloody red dragon on it, and mysteriously only includes the writing "02.01.2011." Anyone can conclude that this is the release date of something very important related to Dragon Age. Could it be Dragon Age 2, Dragon Age: Not Origins, or whatever BioWare decides to call the sequel to Dragon Age? It's possible, but no other information is included on the card to give any real hint. When you consider that BioWare has said that it would be supporting Dragon Age with DLC for one-and-a-half to two years, that period could easily end in February of 2011, though it does seem somewhat early for a full-fledged sequel. However, BioWare obviously had a clear plan with Dragon Age content, putting out DLC on the regular and an arguably early retail expansion pack with Awakening that will hit four months after the release of the original game, which was released in November 2009. If the mysterious release date found in Awakening has nothing to do with a sequel, it could indicate a second larger expansion, or... who knows? Either way, it'll probably look super hot.